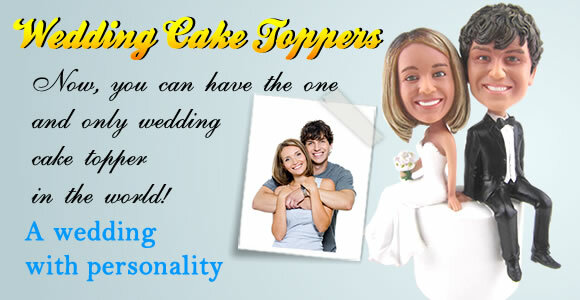 Customize Wedding Cake Topper Bobbleheads From Your Photo to LOOK LIKE YOU! We have a great range of wedding bobble head dolls to choose from. These make the most fantastic wedding cake toppers. Rather than just having a random bride and groom doll, you can pick a couple and have the faces made to look just like you. Send in a photo of the bride and groom to be and the dolls will be able to be sculpted to look just like the photo. You can choose the hair and eye color as well as the complexion and then the dolls will look as realistic as possible. Take a look at how close our example dolls look to the photo of the bride and groom and you will get an idea of how good a job it is possible to do. Imagine what all the wedding guests will think when the cake toppers looks so realistic. It will be great fun and a memento that you will be able to keep afterwards that will remind your forever of your special day. If you do not want it on the cake, you could get one to put on the cake table or the top table. For a fun novelty you could even get different doll poses to go on each of the tables for the guests to enjoy. You can choose from different color suits or outfits and even have some text on the platform they stand on, perhaps with their initials or names.